For a variety of reasons this was the most challenging, and yet in some ways the most intriguing flight yet. A little under 13 hours total flight time took me from Darwin, Northern Territories, Australia to Singapore's Seletar joint civilian/military airfield, but not without a few glitches. First, once I got fueled up (no, we didn't spill any this time! ), got my flight plan filed, grabbed a couple of sandwiches to take along, and strapped into the airplane for engine start in Darwin, it was already about 90 degrees Fahrenheit, and there wasn't much in the way of clouds to shade me from the blazing sun. Once started, single engine airplanes have an advantage over their light twin engine brethren on hot days, as that propeller right out in front of the cockpit blows a refreshing blast of cooling air right by the open cockpit door and window, rapidly making the tight quarters at least less blistering. I was soaking in perspiration by the time I got the engine going, and it felt great to feel the prop thrusting that fresh Australian air back on my soggy pilot uniform. I fired up the radios and called the Tower for taxi instructions. It was then that things began going down hill. I was informed that over half of the main runway was closed for another hour and a half to allow workmen access for scraping off some old painted runway markings, so only about 5,000 ft of the total runway was available for use. Well, I'd just filled the airplane tanks up to 200 gallons total "petrol" and was way too heavy to safely depart from a 5,000 strip. I pleaded with the controllers to see if the workmen would vacate the runway for just the one minute it would take me to takeoff, and indeed they tried. Still, in the end, the impromptu negotiations between the controllers and the paint contractor failed, and I had to shut down my engine and cool (or should I say roast) my heels for an hour and a half until they had finished their work and gone off to have lunch. Finally, at 11:30am local time I was given clearance to startup, taxi, and takeoff using the full length. Unfortunately, by that time the temperature had reached nearly 100 degrees F, the humidity was north of 80%, and what little wind had been blowing down the runway before was now down to dead calm. To a pilot, all of these factors mean poorer engine, propeller, and wing performance, and to me flying an overweight, underpowered airplane in the first place, it meant yet another careful set of performance calculations to determine whether or not I should proceed. With 11,000 ft of runway in front of me and no obstacles off the departure end, I elected to go ahead with the takeoff, but resolved that if I wasn't airborne and climbing out of ground effect by the 7,000 ft point I would land, taxi back, and wait for a cooler day. I did make it, but the 7,000 ft point passed under me without much room to spare. I was really glad that I had waited the hour and a half for that extra 6,000 ft of runway! Calculators don't lie. Dozens of overly aggressive aviators meet their maker every year in an effort to beat the laws of physics. I've resolved not to become one of those statistics. In the hot, muggy air my climb performance was even more sluggish than before, and as I crawled past 5,000 ft of altitude the Aussie ATC controller couldn't resist teasing me about whether or not I shouldn't just take a breather and rest at 5,000 for a while before struggling on. Eventually, after about a half hour at full power, I leveled off at 6,000 ft, and the airplane accelerated quite normally to its usual ferry weight speed of just under 140 KTAS. 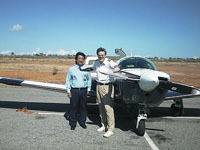 Qantas Airlines station general manager for Darwin, Doug Chan, helping me get ready for departure. He pulled together the most thorough weather briefing package I had ever seen, zipped my documents through customs and immigration for departure, and even helped me stuff my bags into the little Mooney. When all this was done, he refused to accept any handling fees. A really great guy! 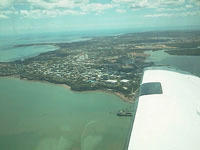 The quaint, little city of Darwin, Northern Territories, Australia, seen from the air as I departed. The next challenge was negotiating the scattered thunderstorms that by now had bloomed along my intended route. They routinely pop up in mid day in this tropical part of the world in what was now becoming the "wet season," and they don't usually dissipate until well after sunset. Fortunately, they were fewer and farther between than forecast, and S turning around them was not a problem. The Indonesian controllers (whose airspace accounts for most of the distance between Australia and Singapore) are quite accustomed to these storms, and they immediately granted routing deviations to all pilots requesting them, including me. One of these deviations took me over a breathtakingly beautiful mountainous area of one of the Indonesian Islands, and I'll never forget the sight. Scattered and wispy clouds were layered upward from the deep green valleys all the way to the sharp ridge peaks, with lush foliage everywhere. I wanted to drop down for a closer look at this tremendous scenery, but I also wished to adhere very closely to my altitude assignment as I traversed this foreign airspace. As luck would have it, the terrain soon rose high enough that I got the view I wanted. By veering just a bit further southwest on one of my officially approved "weather deviations," I was able to come very close to (but remain at a safe distance from) these wondrous vistas. I tried my best with the camera, but what I've shown below is the best I could do. Not bringing a large zoom lens and a good SLR camera was a weight and size based decision, which at that particular moment I sincerely regretted. Sorry folks. You'll just have to come to Indonesia yourself to see the glorious shapes that Mother Nature can take in this part of the world! Another communications problem arose as I approached the very busy Singapore airspace from about 300 miles out. Again, radar is nonexistent in this part of the world, so the controllers do their best keeping airplanes separated from each other by requesting numerous and constant position reporting by all aircraft. The problem is that one single HF frequency was being used for flights over most of the entirety of Southeast Asia. What a party line! There were controllers from three airports (Singapore, Hong Kong, and Manila) all competing for airtime with each other and probably with at least a hundred airplanes as well (all airliners except for me, as far as I could tell). It was murder trying to get a word in edgewise. As a result, when the Singapore controller managed to squeeze himself in for quick calls to me requesting both position reports and "exact" (to within three minutes total tolerance) estimates of my expected times crossing particular latitude/longitude positions down the road, he wanted and needed the answers NOW, before the frequency became congested again and he lost me. Pilots who fly over oceanic or other remote airspace all the time are quite accustomed to spitting out these estimates quickly, but for me, without the aid of a copilot and otherwise busy switching among the seven fuel tanks on board and dodging one thunderstorm after another, it was a bit challenging. To make things worse, the Singapore controller's accent was the least understandable I'd heard since leaving the States, and he couldn't much comprehend my Michigan twang either. It therefore was frustrating for both of us as I punched numbers into my two flight computers, jotted down the crossing waypoint time estimates that came up on the cockpit displays, and tried my best to read them to him. It typically took three tries before we both were understanding the same numbers. Boy, was I relieved when at about 80 NM out of Singapore I was able to switch to VHF (a short range frequency, and thus far less congested) and talk to a RADAR controller who could SEE me on her scope! From there on in it was a piece of cake. The ragged, but majestic Indonesian coastline seen from 6,000 feet. 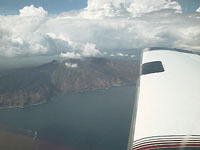 The small black panel shown in the leading edge of the right wing is a fiberglass radome enclosing the Mooney's weather radar antenna. 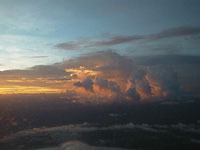 An isolated thunderstorm over Borneo. I included this picture because it's so unusual to catch a glimpse of a storm from an angle like this when the sun is positioned to give it such a colorful backlighting. 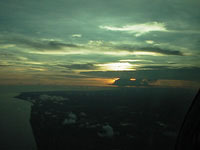 The sun setting over Borneo as I flew toward Singapore. 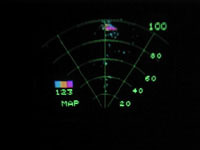 The Mooney's weather radar can also be switched into a "ground mapping mode," whereby its antenna is slanted somewhat downward and the signal pulse length is modified to better "paint" ground terrain features. In this photo the magenta blob at the top of the screen represents radar reflections from the buildings of the city of Singapore about 90 nautical miles in front of the plane. The culmination of this rather adventuresome flight was the discovery, once on the ground, that the airplane's electric fuel boost pump had sprung a small leak, making it un-airworthy for further flight. While this pump is only a back-up to the normal, engine driven fuel pump, I wouldn't attempt any transoceanic flight without it in good working order. Thanks to some Herculean weekend efforts by co-owner Joe Frisolone and senior technician Adam Harris at East Coast Aviation in Bedford, MA, a new pump (supposedly the LAST ONE in the entire USA!) was shipped off to me for delivery early in the week in Singapore. So, I was stuck in Singapore for a few days while awaiting the arrival of my coveted new pump. I doubt that this terrible predicament generated much sympathy among our web site followers, as my friends all know how much I like trolling through consumer electronics stores in Asia. Before I had a chance to blow any money shopping, however, my wallet was saved by the good fortune of a meeting early the next day with local pilot and Unocal Executive Vice President, Barry Andrews. I contacted Barry on his cell phone, per a suggestion by ferry pilot Bill Cox, who had ferried Barry's Beechcraft Bonanza from California to Singapore earlier in the year. Barry and his lovely wife Jean were kind enough to invite me to their home for a great home style barbecued chicken dinner, complete with a hot fudge sundae dessert. Not bad for equatorial Asia, huh!?! On Sunday, Barry took me for a local sightseeing and orientation flight in his airplane. We flew over to Sultan Ismail Airport in Johor Bahru, Malaysia, where we filled up Barry's plane with cheap Malaysian avgas. Barry also showed me around the "JB" airport, including a tour of its control tower. Since Seletar airport (where my Mooney was then parked) was the only one of Singapore's five airports that sold avgas and allowed overnight parking of general aviation aircraft, and since it's runway was only 5,000 ft long, I would need to transition from Seletar to JB later in the week for a fuel stop before embarking on the long flight to my next planned stop of Colombo, Sri Lanka. I was thus delighted to get the chance to check things out there before arriving on my own later and perhaps being surprised with some glitch or another. As it turned out, the Malaysian controllers in JB's tower knew my name immediately as soon as Barry introduced me. The Jeppesen flight planning group back in the States had already been communicating with them for several days in preparation for my arrival, and sure enough, there was a glitch! My landing permit for Malaysia had not yet come through from Kuala Lumpur. The controllers didn't know why, but they assured me it should come through in time for my proposed flight. They were a little relieved to hear that my fuel pump problem would delay my arrival at JB for at least a day, giving them more time to "work the system." They were really very nice guys, and we spent a pleasant half hour chatting with them and enjoying a great view of the Malaysian countryside from the vantage point of their tower cab. Back at my hotel in Singapore, I used the two days waiting for my new fuel pump to work on flight plans for my remaining legs. Upon the strong recommendation of every international ferry pilot I had consulted, I planned to avoid landing in India at all costs. India is famous in the general aviation community for its exhorbitant landing and handling fees, archaic bureacracy, and difficulties in obtaining overflight and landing permits. Still, as a precaution I had obtained an Indian tourist visa before leaving the States, since the alternative landing stop for me in the Indian Ocean, Sri Lanka, could not always be counted on for avgas availability. Luckily for me, I remembered to inquire about the latter when conversing by phone with the Jeppesen folks, and they agreed to check it out. While their quick investigation showed that the airport in Colombo, Sri Lanka did, indeed, have the fuel I needed, it also turned up a recently issued US State Department warning to tourists about visiting that country. Jeppesen faxed me the report, and it got my attention. Apparently a large faction of armed insurgents had taken control of a substantial portion of the island nation, and terrorist bombings in the capital city of Colombo were now taking place right downtown in the business and tourist areas. I wasn't as worried about the bombings themselves as I was about airport security and the safety of an American registered aircraft sitting on the ramp in Colombo. To check it out, I placed a call to the US Embassy in Colombo. The folks there were very helpful, and I was quickly connected to an ex-military pilot involved with monitoring security issues in Sri Lanka. He was cordial, frank, and extremely helpful. The bottom line was that the insurgents had just issued a public warning that they would target their Stinger ground-to-air missles at civilian aircraft overflying Sri Lankan airspace. Their objective was apparently to kill Sri Lankan government officials riding in the country's turboprop airliners, but the Embassy man cautioned me that a young Sri Lankan rebel might not know the difference between my Mooney and one of those small airliners when firing from a mile or two away. I certainly didn't ignore his cautionary remarks! My very next phone call was to Jeppesen, requesting that they begin negotiating with Indian aviation authorities to get me the necessary permits to stop there. It would be an expensive and bureaucratic alternative to fly via India instead of Sri Lanka, but the added safety factor made it my strongly preferred course of action. As always, Jeppesen came through. But the best they could get for me was a 48 hour landing and overflight permit. I took it, and was very grateful! The new plan was to leave Singapore on Wednesday morning, fly to JB in Malaysia for fuel, spend a day sightseeing there, then head across the Indian Ocean to Madras (recently renamed Chennai), India. Where to after that? My initial intention had been to cross India and the tip of the Arabian peninsula enroute to Bahrain, followed by an overflight of Saudi Arabia on my way to Luxor, Egypt. From there I could make various vacation stops in the Mediterranean before launching from either of the Scottish or Portuguese coasts to cross the Atlantic and return home. However, the recent US cruise missile attacks on targets in Afghanistan and the Sudan (unsuccessfully targeting Osama Bin Laden . . . remember, this was in the Fall of 1998) had resulted in a considerable souring of relations between the American, Arab, and certain North African governments. Not only was my American registered aircraft now blocked from crossing either of the two targeted nations, but the Saudi government also informed my Jeppesen flight planners that I would not be permitted to cross their airspace at any altitude or along any route flyable by the Mooney. I was facing a barrier almost 4,000 miles long stretching from the Himalayan Mountains on the north to Sudan, Somalia, and Ethiopia on the south, through which I could not pass! The only possible portal through this otherwise impenetrable barrier was, of all places, Iran. In the interest of obtaining hard foreign currency in exchange for overflight permits, the Iranians had allowed a number of Jeppesen's corporate jet customers to use their airspace to cross from the Indian Ocean into Turkey, and thence on toward various European destinations. The advisability of me flying that route over less than friendly terrain and populations at the Mooney's low altitude was questionable, and the Jeppesen folks certainly didn't recommend that I consider that as a viable alternative route. The solution that presented itself as I combed a world map looking for friendly islands in the Indian Ocean was the Seychelles. A scattered series of tiny tropical islands, the Seychelles is an independent nation located about 500 miles NNE of Madagascar. It's capital city of Victoria has a suitable international airport, and from there the more hospitable cities of Southern Africa would be within the Mooney's reach. Another call to Jeppesen got the wheels moving on that diversion, as well as on the resulting decisions setting forth all the subsequent stops: Zimbabwe, Namibia, Gabon, Sao Tome, Ivory Coast, and Cape Verde, followed by an Atlantic crossing back into the Western Hemisphere. First things first, though. Getting to the Seychelles from Madras, India (the only city in Southern India that would permit my initial landing and departure) would be a severe stretch of my range. I needed a fuel stop in between. The obvious choice was the Maldives Islands, another small nation located off the southeastern Indian coast. However, a check by Jeppesen revealed that the only suitable airport there had no avgas! This shortage of fuel was fast becoming a painful and recurring theme of my trip. Avgas had been universally available throughout the world a decade ago, but now it was becoming unclear how much longer it would be possible for piston engine aircraft to circumnavigate the globe. Even Russia, a significant oil producer in its own right, reportedly no longer stocks or sells avgas at most of its airports. Still, I needed to find gas for this India - Seychelles leg, and the only remaining alternative was for me to make an additional unplanned stop in Southern India, most likely in the resort city of Trivandrum. I was informed that the airport at Trivandrum could provide up to 60 gallons of avgas, but no more. I couldn't understand this limitation (they either had the stuff or they didn't, I thought), so I just ignored it and planned for Trivandrum as the next stop to follow Madras. 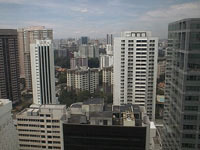 Modern Singapore as seen from my hotel window. 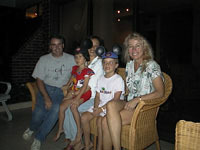 The Andrews family in their back yard in Singapore. That's Barry on the left, his wife Jean (partially hidden), family friend Eve Stangor, and their daughters Gina and Erin. The Mickey Mouse ears were definitely a California import, but who knows, they might have been originally made somewhere nearby in Asia! Barry's Bonanza on the ramp at Sultan Ismail Airport in Johor Bahru, Malaysia, where Barry had flown me for a short sightseeing jaunt. 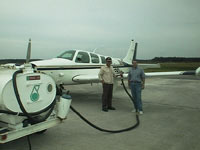 The fellow to the left is fueling Barry's plane from a small 1,000 liter fuel trailer that was pulled behind a pickup truck. Fuel here is much cheaper than in Singapore, so pilots from the latter have a great made-to-order excuse to give their spouses on why they must take this short, scenic flight on the weekends. Buying fuel here makes the net cost of the flight itself virtually zero. This was the excellent handling staff at Universal Aviation of Singapore that helped me throughout my stay there. For a very reasonable fee they handled all my paperwork for both arrival and departure, arranged emergency weekend maintenance when my electric fuel pump failed, provided me with in-flight food and drinks, and even managed to scrounge up special 5 liter containers so I could carry extra engine oil for my upcoming flight legs into the Third World. They were terrific!